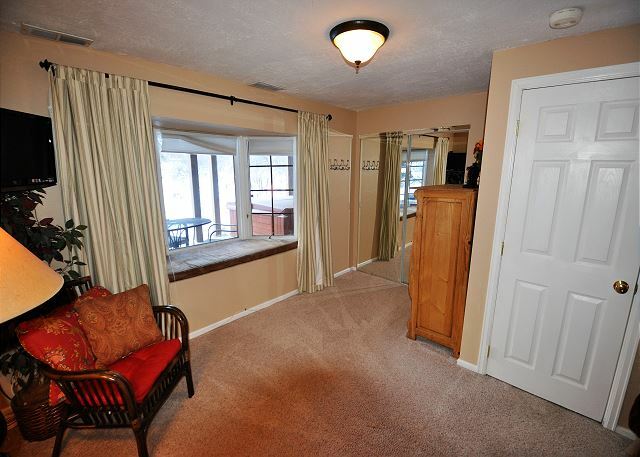 Managed by Gore Creek Properties, this is the downstairs part of an up-and-down gold rated duplex. It sets right beside the Gore Creek and looks straight up at the Gore Range Mountains: spectacular! The upstairs can also be rented for those requiring a total of 5 bedrooms. 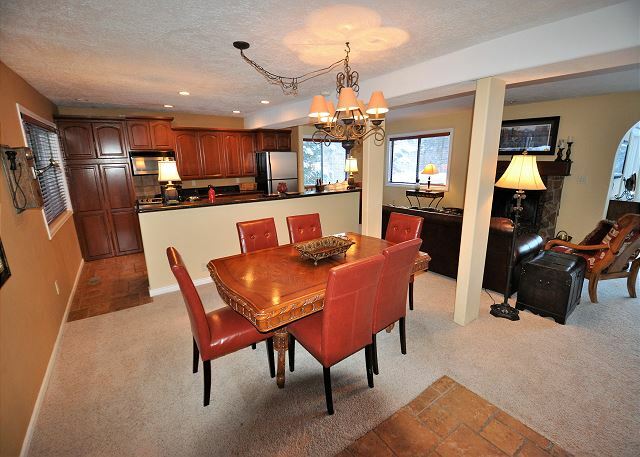 The bottom duplex has 2000 square feet and is located in East Vail directly on the Gore Creek just 5 miles from Vail village. The home has 3 bedrooms and 2.5 bathrooms and will accommodate up to 7 people. It has a lovely kitchen and dining area with a wood burning fireplace in the sitting room. 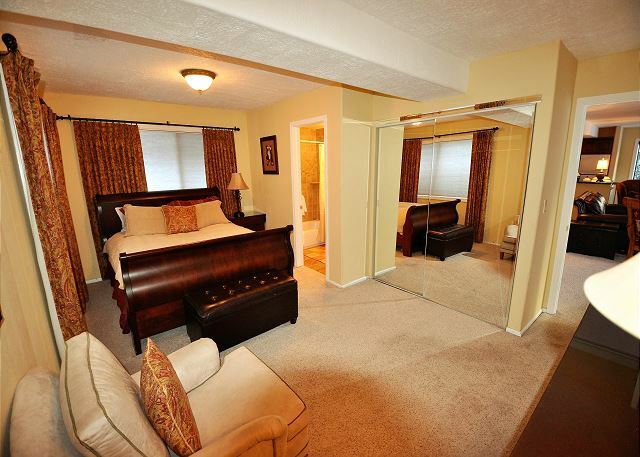 There is also a separate sun/TV room on the main level with a huge TV and entertainment center. The upstairs provides an additional 1000 sq ft and 2 bedrooms so please call the office for combined availability. There is a private hot tub downstairs just outside the home. The free shuttle stop for the bus which in the winter runs every 15 minutes into Vail is a short walk up the road.This property does not allow any pets and is NO SMOKING. We came from Denver and the rental was beautiful and Nancy and Tere were so helpful! Very nice three bedroom location with wood burning fireplace and Jacuzzi. Not too far from the free ski shuttle to Vail. Would definitely return. Beautiful accomodations. Awesome view. Good sleeping space for 6 plus sleeper sofa. Spacious living area for dining 6. Lots of space to lounge in front of FP near kitchen. Seoarate space for TV area with comfortable sectional sleeper sofa. Hot tub is a plus. On smaller size for 4 to 5 people. Hot tub coil use some maintenance and repair since not all jets and features working. Pots and pans in kitchen need replacement. Teflon is shot therefore food sticks terribly. Also need large pot dutch oven. Amazing weekend away with old friends! What an amazing home to rent for the weekend! A group of 5 of my friends and I got this place and it was outstanding! It could have slept a few more pretty comfortably too I think - especially if there are couples. Anyway, location was great - close to the shuttle to the mountain. Huge kitchen that has everything you could need, nice private hot tub and massive living room for hanging out and watching the game after a long day on slopes. 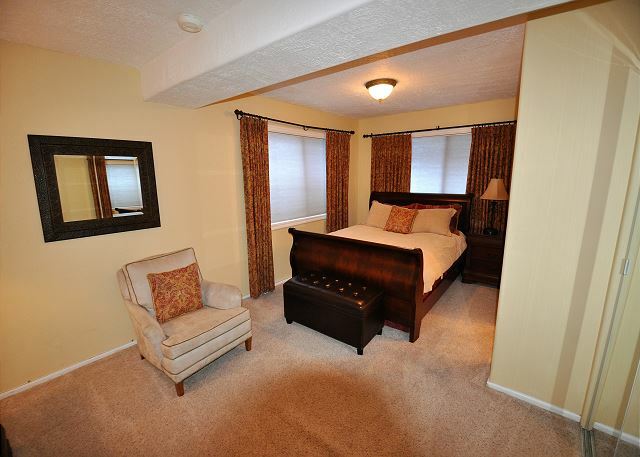 Very nice amenities and finish to the home including granite countertops, vaulted very high ceilings, etc. We absolutely had a blast and whenever I'm in the area - I will be renting this place again. I recommend this property very highly. We'll be staying here again! Great house! What an awesome house and location! You'd think, being the lower unit it wouldn't get a lot of light, but the floor plan is such that it feels like an entirely separate unit once you step inside and the entire back wall nearest the living room is floor to ceiling windows. It's well appointed having just about everything you'd need (there were a few things missing that should normally be there - drawer labeled foil and plastic wrap, had none, and no lighter to light the grill - push ignitor no longer works - but it was the end of the season!). Hot tub is in great condition, and the decor is beautiful. Couch and common areas are super comfortable, with plenty of space for social activities. Great place for a ski vacation! This house was more than spacious for the 5 of us staying there. The pictures don't do it justice. 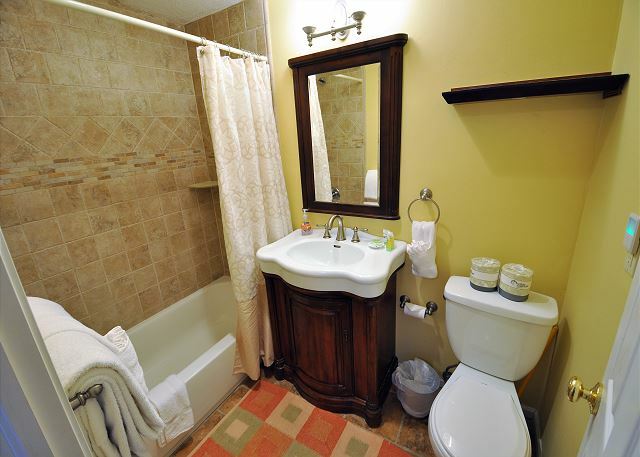 Everything was clean and the kitchen/bathrooms have all the amenities that you need. If you are staying in the upstairs bedroom you can hear the people upstairs but they were not loud at all. The living room views are great and even the view from the hot tub! Definitely would stay here again. The only issue we had was that the internet had stopped working while we were staying there and we couldn't find the router to reset it. 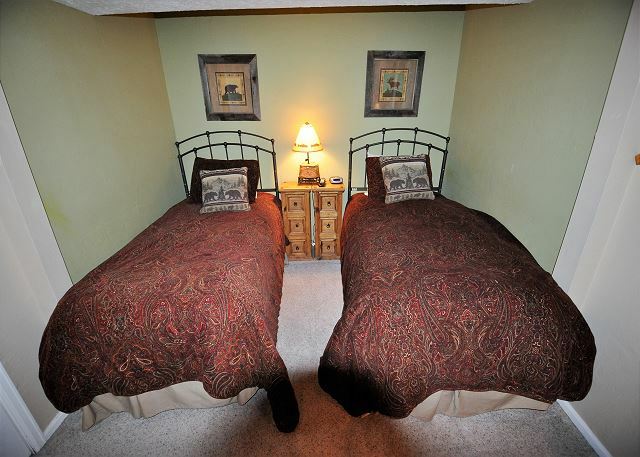 Great accommodations in East Vail! 1. Parking in the front made it difficult to get in and out of the property with luggage and equipment. There was a vehicle routinely parked right in front of the entrance. 2. We were without internet for 1.5 days. The management team was quick to resolve the issue - although I felt that I was inconveniencing them when asking them to expedite its repair. Good place, everithing you need is available. Beautiful view from the living room. Free shuttle in to town, just great place. Incredibly well accommodated, pictures don't do it justice! Four of us stayed at the lower unit of this duplex the weekend after President's day weekend in late February. This was my first trip to Vail. The house is beautiful on the inside and has a shockingly thorough stock of amenities. We cooked a full dinner two nights in a row (steak, veggies, potatoes, etc) and were only able to do it because the kitchen was SO WELL STOCKED. There were appliances for almost every need (coffee maker, toaster, blender, whatever) and cooking supplies everywhere including a diverse spice rack, oil, ample pots, pans, and dishes. Only more impressive was that everything was so well organized and labeled in the kitchen too. The flow of the house is great. The living room space nicely bends around beautiful vaulted windows to a huge sectional couch. The flatscreen TV w/cable, in-unit laundry, and *perfectly working * hot tub put it over the top. Extra points awarded as the hot tub appeared to be pre-heated by the Gore Creek staff before our arrival! The shuttle system to vail is efficient and painless. I was never waiting more than 10 minutes coming or going, and local pickup in the neighborhood was great. I chartered a Colorado Mountain Express (CME) shuttle one-way back to Denver airport and they picked me up at door with no problems. Again, perfect experience. I would recommend this property to anyone and also recommend the management company to anyone.